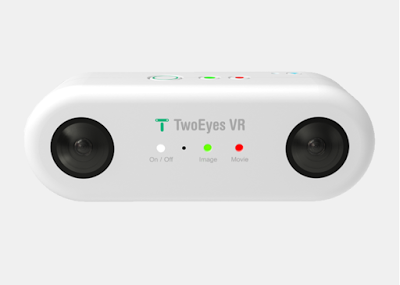 TwoEyes VR reaches crowdfunding goal in just 2 days! TwoEyes VR, a 3D 360 camera, launched on Kickstarter just a couple of days ago, and it has already reached its crowdfunding goal! I can’t say I’m surprised because it is currently the most affordable 3D 360 camera and, at its early bird price plus shipping, it is the most affordable 4k 360 camera. To maintain its momentum, TwoEyes is now offering a free Cardboard VR viewer (this one is literally cardboard) for referrals. As you know, crowdfunded projects are not preorders and can sometimes fall through even after reaching its funding goal. Hopefully the camera is produced as promised (due in August) and the actual video quality is as good as the samples, without flickering. I backed this project and I also preordered the Vuze camera, the first affordable 3D 360 camera (due for release in March). The Vuze camera aims for a slightly different segment of the market because it uses eight cameras (versus four for TwoEyes), which enables it to maintain the 3D effect even when videos are viewed at 90 and 270 degrees, but costs more. I will eventually be comparing them if and when I have them both.